HomeNCAAFootballGary’s Week 5 College Football Recap: Notre Dame looks great, Ohio St comes back, 13 undefeateds left, and more! Gary’s Week 5 College Football Recap: Notre Dame looks great, Ohio St comes back, 13 undefeateds left, and more! There were some less-than-interesting games this weekend, but, luckily, the two Top 10 matchups were not the only ones worth watching. Clemson gave us some intrigue, Kentucky continued what they do, and a lot more continued. Chris had a monster gambling weekend. Seriously… he was on fire yesterday. See what he did on our gambling picks page, or on the YouTube video. There are only 13 undefeated teams left. 5 weeks are in the books, and – out of 130 FBS teams – there are only 13 undefeated teams remaining. This game was 24-17 heading into the 4th quarter… but it was never really that close. Notre Dame QB Ian Book went 24/33 for 278 yds and 4 TDs, and Notre Dame racked up 550 total yards, while holding Stanford to only 229 yds on the evening. KJ Costello looked out of sorts, thanks to that Notre Dame defense, and the Stanford rushing attack could only muster 55 yds on the ground. Stanford, towards the end of the game, looked gassed. A trip to Eugene and South Bend in back-to-back weeks can do that to you. Barring a significant upset, this team will be 12-0, and will keep a couple of Power 5 conferences out of the playoff. Ohio St escaped the “White Out” in Happy Valley. Dwayne Haskins matured, big time, in the 4th quarter against Penn St and found a way to come back from being down 26-14 with less than 8 minutes left in the game. Penn St has to feel absolutely sick about letting this one get away. With only [1:22] left in the game, on 4th and 5 at the Ohio St 43, why would James Franklin’s coaching staff call for a run up the middle with Miles Sanders (which went for a 2 yd loss)? Sanders ran 16 times for 43 yds (2.7 yds per carry). That played right into Ohio St’s defense. Watching the game, I could not, for the life of me, figure out that play call. Ohio St had been able to stop the running game (sans scramble plays by McSorley) with just their down 4, so a run up the middle had very little chance of being successful. Ohio St now has road trips to Purdue, Michigan St, and Maryland, along with Michigan coming into the ‘Shoe, but this team looks like they’ll be 12-0 heading into the Big 10 Championship game. Clemson survived a scare, and life ain’t so good without both QBs. This was a rough week for Clemson, as senior QB Kelly Bryant announced he was transferring after the coaching staff announced freshman Trevor Lawrence would be the starter going forward. During the 2nd quarter, Lawrence went down with a head injury (he’s in concussion protocol), and they had to call in backup Chase Brice, who was 6th on the QB depth chart last January. Brice wasn’t great – going 7/13 for 83 yds and 1 int – but he handed the ball off great to Travis Etienne, who ran 27 times for 203 yds and 3 TDs, including the game-winner to make it 27-23 with [0:41] left in the game. Clemson’s schedule isn’t exactly scary, but there are teams that will be able to stop the run, if the Tigers run into a situation like this again. Another question… how good is this Clemson team? Are they just complacent, seeing as they’ve been almost 3 TD favorites in every game this year, or are they actually just a good, not great, team? West Virginia’s first road trip was a success. We were sold a Big 12 shootout in this one, and, in the first half, got a blowout. West Virginia raced out to a 35-10 lead at halftime in Lubbock, after superstar freshman QB Alan Bowman went out with an injury. The 2nd half was a whole different story. 3rd string (at the start of the season) QB Jett Duffey went 16/27 passing for 172 yds, 1 TD, and 2 int, and led a fierce comeback to get the game back to 35-27, and had the ball with more than 3 minutes left, before Duffey threw a pick-6 that effectively ended the game. West Virginia has looked good through 4 games, and they’ve got Kansas, Iowa St, and Baylor before their ridiculous November begins. The Mountaineers should be 7-0 before traveling to Austin to play Texas on Nov 3rd. Dan Mullen’s Gators get a win in return to Starkville. This was the game everybody circled in the offseason. Former Mississippi State coach Dan Mullen leads Florida back to Starkville against a Mississippi State team that a lot of prognosticators believed had more talent than the Florida team he was taking over. Well, Mullen got the last laugh. In what was supposed to be an offensive battle, Florida got the win 13-6, as Miss St QB Nick Fitzgerald showed, for the 2nd straight week, that if you force him to beat you throwing the football, he won’t be able to do it. Fitzgerald went 11/26 for 98 yds, and ran 20 times for only 32 yds. Florida outgained State 357 yds to only 202 yds, and it sets up a nice matchup between LSU and Florida this coming weekend, in Gainesville. Florida has a shot to move to 5-1 with a win over LSU, and then 6-1 (if they win at Vanderbilt), before heading to Jacksonville to play Georgia. Virginia Tech bounced back from their ugly loss at Old Dominion last week with a 31-14 win at previously undefeated Duke. 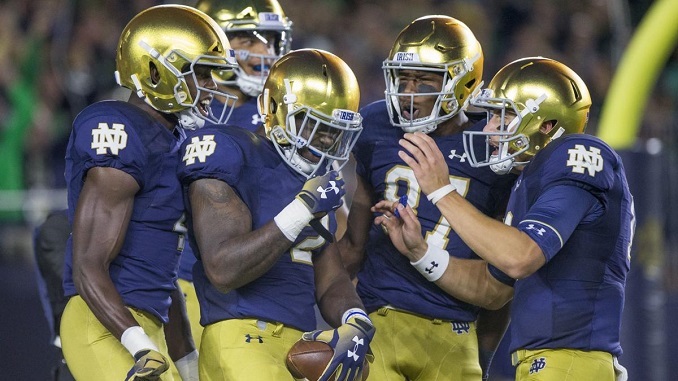 It makes Notre Dame traveling to Blacksburg this week a little bit more exciting. Kentucky ran for 195 yds and got 4 turnovers from South Carolina as they whipped the Gamecocks 24-10, staking their claim for 2nd best in the SEC East, and moving to 3-0 in the SEC for the first time since 1977. Oregon bounced back from a heartbreaking loss to Stanford last week with a 42-24 road win at Cal. Oregon scored 28 points in a 7 minute span between the 2nd quarter and the beginning of the 3rd quarters, which included a long run for a TD, a long pass for a TD, a fumble return for a TD, and a long 74 yd run on the first play of the 2nd half that enabled a 1 yd TD run to make it 35-10 after Oregon was down 10-7 with less than 6 minutes left in the 2nd quarter. Michigan went down 17-0 at Northwestern before clamping down on defense, and finding ways to get points on the board in a 20-17 road win. This was the biggest come-from-behind win in Jim Harbaugh’s career. Next up: Maryland. Washington hammered BYU 35-7. Not much to say about this game. Georgia did not look good, even in a 38-12 stomping of Tennessee, who had only gone 3-13 against the spread in their last 16 games vs FBS teams. Auburn’s offense has looked terrible in the last 2 games against Arkansas and Southern Miss. Yesterday, in a 24-13 win over Southern Miss, the Tigers only managed 341 total yds, and only 96 of those came from the running game (with Kam Martin getting 90 of those on 24 carries). Texas went up 19-0 at Kansas St before hanging on for a 19-14 win the week before playing Oklahoma in Dallas. Just a reminder for that game… Tom Herman, as a coach at any level, is 22-1 against the spread as an underdog, and the Longhorns will definitely be underdogs against the Sooners this week. LSU stomped Ole Miss 45-16. The offense seems to be getting a little more confident. UCF 45 Pitt 14. Another Power 5 win for the *National Champs.